The SYBARITE5 string quintet will perform at 7:30 p.m. Thursday, Oct. 18, in W.M. Turner Auditorium on the SFA campus as part of the College of Fine Arts' University Series. NACOGDOCHES, Texas - The commanding performance style of SYBARITE5 string quintet comes to W.M. Turner Auditorium on the Stephen F. Austin State University campus when the group performs in the College of Fine Arts' University Series. Known for its startlingly eclectic repertoire - from Piazzolla to Brubeck to Radiohead - SYBARITE5 comes to SFA Thursday, Oct. 18, for a 7:30 p.m. performance. The group is turning heads throughout the music world, according to Scott Shattuck, associate dean of the College of Fine Arts and director of the series. "This is a sensationally exciting string ensemble," Shattuck said. "They've promised to play some classics for us, but you just can't hold them back from the tango, jazz, pop, art-rock and other contemporary music that they love." "Their rock star status...is well deserved," the Sarasota Herald Tribune stated about SYBARITE5. "Their classically honed technique mixed with grit and all out passionate attack transfixes the audience." Dubbed the "Millennial Kronos," SYBARITE5's debut album, "Disturb the Silence," quickly reached the top 10 on the Billboard charts. The group's follow-up album, "Everything in its Right Place," was released at Carnegie Hall to critical acclaim. 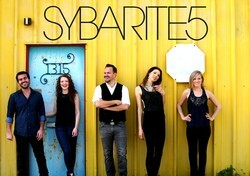 SYBARITE5 recently released its latest album, "Outliers," featuring all new works from American composers. It rapidly rose to No. 1 on the Billboard Classical chart. SYBARITE5 is the first group of its kind to win the Concert Artists Guild International Competition. Comprised of Sami Merdinian and Sarah Whitney, violins; Angela Pickett, viola; Laura Metcalf, cello; and Louis Levitt, bass, the ensemble has taken audiences by storm all across the U.S., forever changing the perception of chamber music performance, Shattuck said. "Lovers of classical music will be thrilled, no doubt, but so will fans of other musical styles," Shattuck continued. "They're fierce, they're fun, they're hypnotic. I've simply never heard anything like them." Highlights of recent seasons have included performances in 43 states and counting, from the Library of Congress to Anchorage Concert Association, as well as concerts in SYBARITE5's home of New York City at Carnegie Hall, Lincoln Center, the Apple Store and the 92nd Street Y. In addition to its own groundbreaking, portable music festival, Forward Festival, SYBARITE5 has appeared at Ravinia, Caramoor Center for the Arts, Wolf Trap Opera, Grand Teton Music Festival, Aspen Music Festival, Interlochen Center for the Arts, Chautauqua Music Festival, Look and Listen Festival and many others. International appearances include Canada's Tuckamore Music Festival, the New Docta International Music Festival in Cordoba, Argentina, and the Osaka Festa in Japan. The SFA performance is sponsored in part by Cataract, Glaucoma, Cornea & Retina Consultants of East Texas/Benchmark Optical/Medical Arts Surgery Center. Prior to the performance, Dr. Jennifer Dalmas, associate professor of violin and viola in the SFA School of Music, will present an informative talk at 7 p.m. in Griffith Gallery. The gallery is located across the hall from Turner Auditorium, which is inside the Griffith Fine Arts Building, 2222 Alumni Drive. The audience is invited back to the gallery for a post-performance reception to meet the performers and to honor the corporate sponsor. Single event ticket prices for the University Series are $25 for adults, $20 for seniors and $10 for non-SFA students/youth. Tickets for SFA students are $3. For more information or to purchase tickets, visit finearts.sfasu.edu, stop by the Fine Arts Box Office in Room 211 of the Griffith Fine Arts Building, or call (936) 468-6407 or (888) 240-ARTS.